Ditch the donna kebabs and choose these lovely lean meaty kebabs coated in a flavoursome yogurty garlic and lemon marinade. Serve them with a crunchy salad. 1 In a large shallow bowl, mix together the yogurt, lemon zest and juice, garlic, mustard powder and tomato puree. Add the lamb and stir to coat well. Cover and marinate in the fridge for 1 hour or longer if time permits. 2 Preheat the grill to medium. Thread the lamb and cherry tomatoes on to eight metal skewers (or wooden skewers that have been soaked in water for 20 minutes), brush with the marinade and grill for 5 minutes on each side or until cooked to your liking. 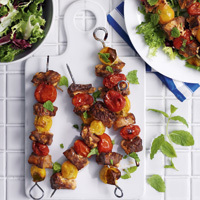 3 Transfer the kebabs to warmed plates, sprinkle over the mint and serve hot with a crisp salad.